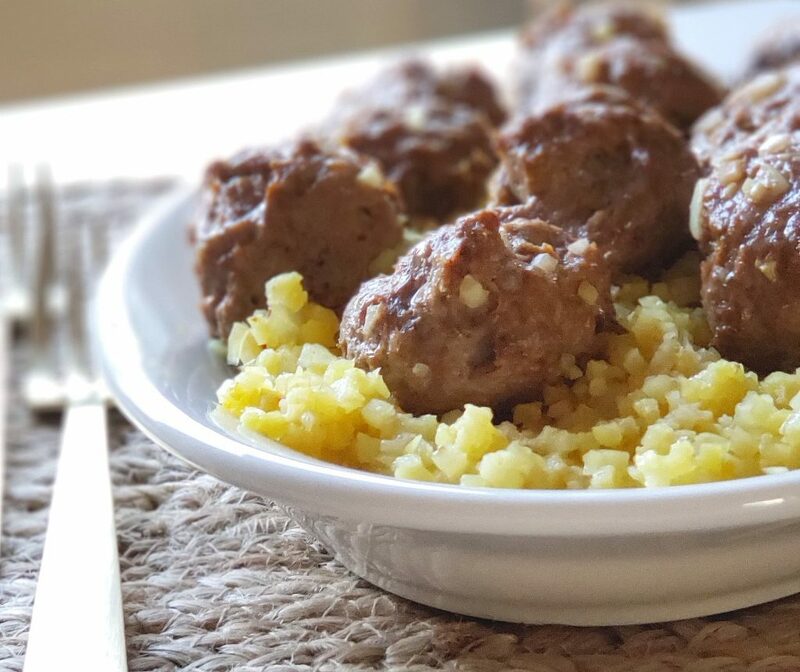 These Easy Lamb Meatballs over Saffron Cauliflower Rice only require 10 minutes prep time and cook in one pan, making this low-carb, keto, Paleo and Whole30 compliant Mediterranean-inspired recipe a great weeknight option! There’s a Mediterranean restaurant near us with food that is absolute perfection. 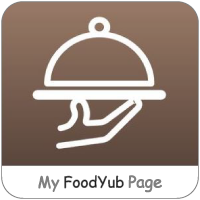 It’s not fancy or expensive, but their menu includes all of the traditional foods you’d expect to find at a Mediterranean restaurant, and their use of herbs and spices is exquisite! Of course, as an avid cook and food blogger, eating at this Mediterranean restaurant makes me wonder what herbs and spices they use and how I can recreate their recipes. 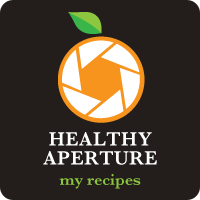 Their food inspires me so much that I’ve considered recreating their flavors the litmus test of “making it” as a cook. Let’s just say I’m pretty proud of myself because these Lamb Meatballs over Saffron Cauliflower Rice come pretty darn close! 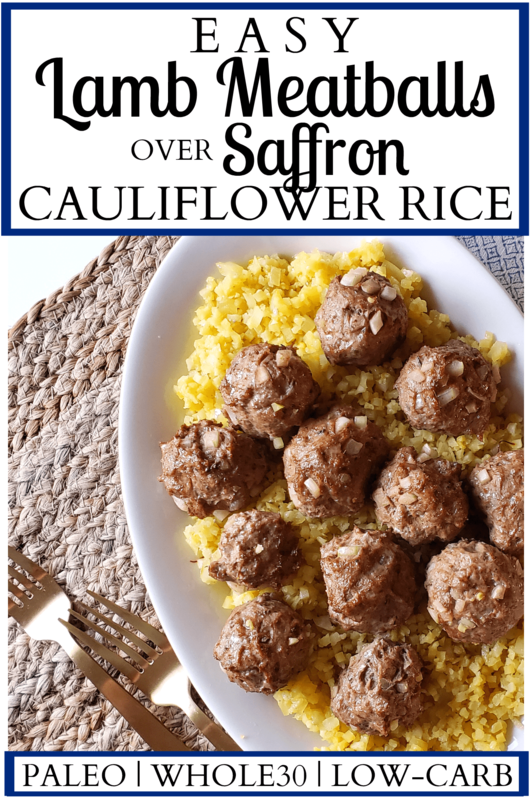 The herbs and spices in the lamb meatballs create a beautiful melody that is perfectly complemented by the saffron cauliflower rice, which gets lots of flavor from the fat that renders out of the meatballs while roasting. It’s a match made in Heaven, if I do say so myself! But not only are the flavors in this dish da bomb, you only need one pan for this recipe, making it super easy! 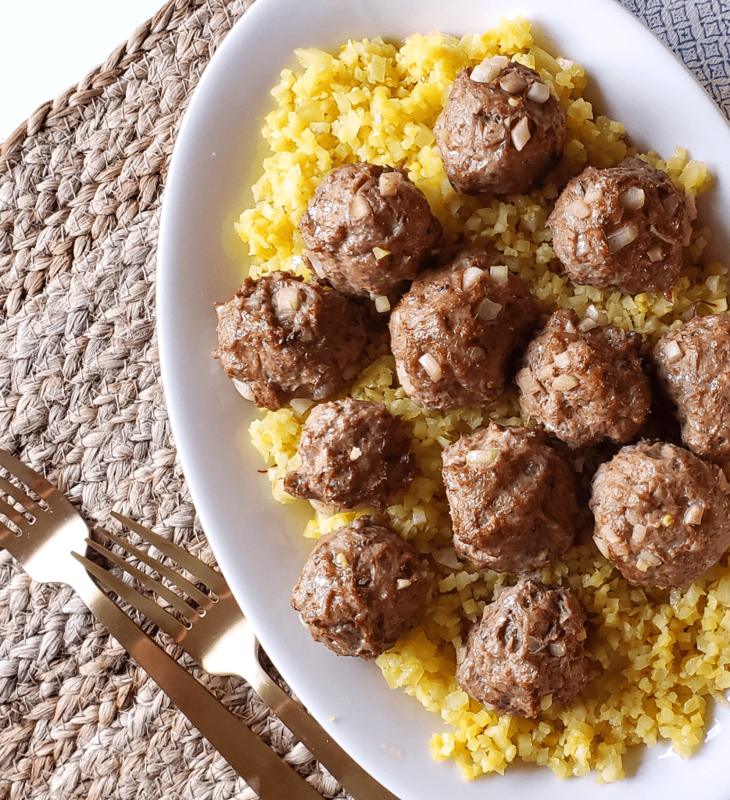 These lamb meatballs over saffron cauliflower rice aren’t just easy, they’re a healthier version of the food at my local Mediterranean restaurant. 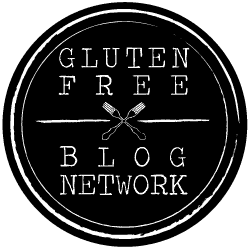 Cauliflower rice in lieu of regular rice makes this recipe low-carb, Paleo, Whole30 and keto-compliant and provides fiber, vitamin C, vitamin K, B6, folate and choline as well as sulforaphane, isothiocyanates, and glucosinolates, antioxidants in cruciferous vegetables that may help to fight cancer, balance hormones and keep the heart healthy (source). Lamb is a great source of vitamin B12 and B3 (niacin) and the minerals selenium, zinc and phosphorus, nutrients which are used for everything from making strong bones to protecting the body from free radical damage. Lamb is also considered an allergy-friendly protein and can be a great source of omega-3 fatty acids and CLA (conjugated lineleic acid) when the lamb is grass-fed (source). Don’t forget about the herbs and spices! Paprika is rich in antioxidants, particularly carotenoids, and coriander seed and cumin both are great for digestive health, as coriander has antibacterial properties that help to prevent food poisoning and cumin encourages the secretion of pancreatic enzymes, helping to reduce gas and bloating (source). 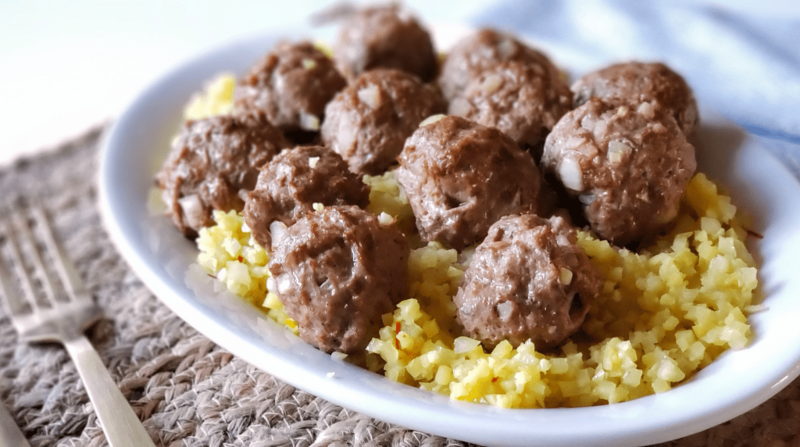 The result is Easy Lamb Meatballs over Saffron Cauliflower Rice that is full of flavor and nutritious ingredients but free from gluten, dairy, grains, eggs and nuts, making this recipe allergy-friendly, low-carb, Paleo, keto and Whole30 compliant! These Easy Lamb Meatballs over Saffron Cauliflower Rice are so easy that it only requires 10 minutes prep time and one pan, but I’ve provided a few tips below that will make this recipe even easier. You’ll see in the video below how easy it is to measure and form meatballs with a cookie scoop! My cookie scoop has a 1 1/2 inch diameter and only cost $12 on Amazon (it also comes in handy to make my Double Chocolate Chip Pumpkin Seed Cookies)! I use frozen cauliflower rice to make this recipe, but you could also use freshly riced cauliflower. Costco has a great price on both fresh and frozen cauliflower rice, but I’ve also seen cauliflower rice at both health food stores like Trader Joe’s and traditional supermarkets like King Soopers (Kroger) and Walmart. Of course, you could also rice your own cauliflower, I just prefer to skip that step! 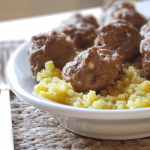 Here’s a video showing you how easy it is to make these Easy Lamb Meatballs over Saffron Cauliflower Rice. After watching it, keep scrolling down for the recipe. Enjoy! Place the saffron threads in a small bowl with ¼ cup hot water. Let soak for 5 minutes to open up the flavor. Mix all spices together before adding ground lamb and onion. Use hands to mix well. Roll into meatballs and set aside. Place the cauliflower rice in a baking dish. Add the onion, salt, avocado oil and saffron in water and toss to combine. Arrange the meatballs over the cauliflower rice and roast at 400 degrees for 25 minutes. After cooking, remove the meatballs and stir to combine with the fat and juices that rendered out of the lamb meatballs into the cauliflower rice. Serve with a scoop of cauliflower rice on bottom and meatballs on top. Enjoy! everything about these meatballs looks amazing!! Those spices, yum!! I haven’t played with saffron much….the price tag has always intimidated me! YUM! I love lamb meatballs! They are so juicy and flavorful and go well with so many different spice seasonings too. Thank you for sharing this family and holiday friendly recipe! Love this whole meal. What great spices in the lamb and that saffron cauli rice – yum! We love lamb! But I’m always intimidated by saffron because it’s so pricey. Will have to give this a shot! I love how simple and easy this meal is. Saffron is a favorite of mine, but I don’t use it enough, it’s such a lovely addition to the riced cauliflower. This is so tasty! Love the saffron! 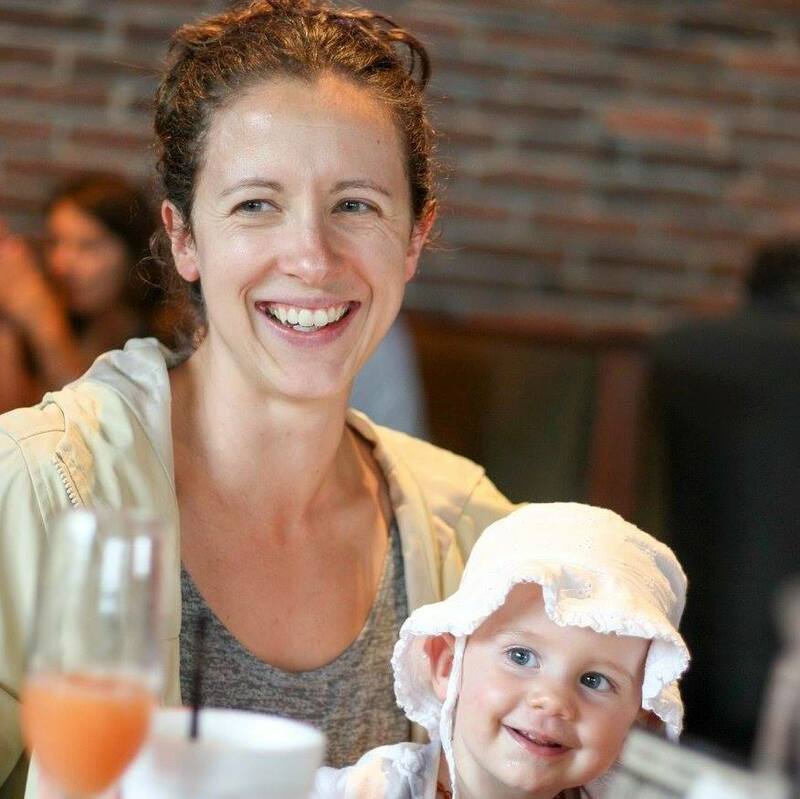 Elaina, my tummy is much happier with grain-free meals, too. Thanks for passing it on to your dad. I hope he enjoys this recipe! This recipe looks like it’s to die for! I love the idea of saffron with the cauliflower rice. And the meatballs just look like they’re packed with flavor. Mmmmm! Why do I never cook lamb? These look so good and I’ll bet even my kids would like them. Can’t wait to try them! I haven’t had lamb in a long time, but your recipe has inspired me to try it again. They look delicious and cauliflower is an amazing option instead of rice. Thanks for sharing with us. Yum! This recipe was delicious! I added frozen peas and carrots to the cauliflower rice for an extra veggie boost and was pleased with the results. Thank you for sharing; this is definitely a keeper recipe!